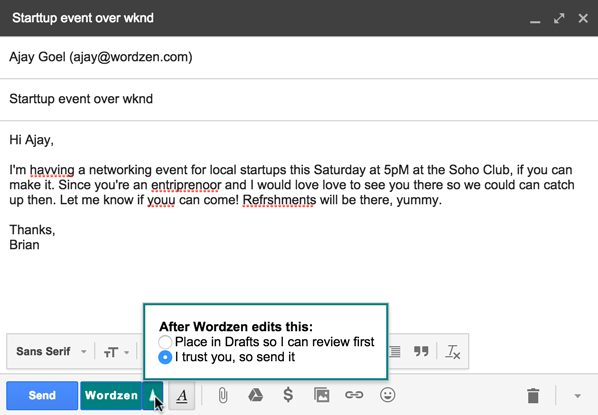 When you use Wordzen to edit your emails, you’re given two options, “Save” and “Send.” You can find these in the Settings option next to the Wordzen button, which allows you to change the settings for each individual email. Previously, this option was an account-wide setting you could manage by logging into www.wordzen.com. However, that account-wide setting is no longer relevant. When you select “Save,” our editors send the edited message back to you for review before you ultimately send the message to its intended recipient. You should choose “Save” if you’re a new user, if there’s particularly sensitive information contained in the email, if there’s a complex idea you’re trying to explain, or if you just like to double-check things before sending. You’ll find these edits saved as a Draft once they’re complete. When you’re in a hurry and need to respond quickly, you can hit “Send.” This is also a good option when you’re writing quick responses that aren’t complicated or are part of an email thread that the editor can use for reference, or you’re an experienced user whose emails generally contain similar content. When you choose “Send,” our editors send the message directly to its recipient once they’ve finished editing it. Keep in mind that if you choose “Send,” but our editors have a question about the message and would like you to review it, they have the option to hit “Save” and send it back to you. While this doesn’t happen often, it can give you confidence that your message will always receive the highest level of attention. To use these, simply choose which option you’d like before hitting the Wordzen button. The setting will always default to the last one chosen, so if you elect to have an email saved as a Draft, then “Save” will be the default choice on your next email. If you elect to have an email sent after editing, then “Send” will be the default choice on your next email. However, you can always change your selection with the click of a button. No matter which option you choose, our Wordzen editors are standing by, ready to help you craft the perfect message or reply.